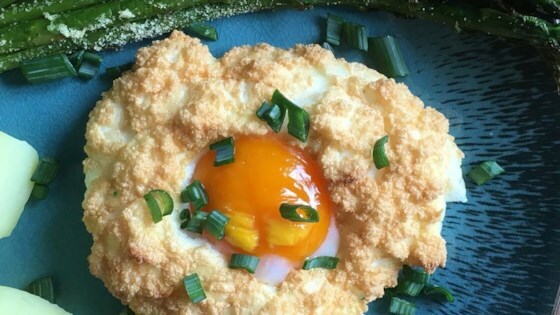 "This recipe for cloud eggs, centuries old, was developed in France, called Eggs in Snow, or Oeufs a la Neige. It's a show-stopping brunch dish that is actually ridiculously easy to make." Beat egg whites, salt, and pepper in a bowl with an electric mixer until stiff peaks form. Fold Parmesan cheese in gently. Make 2 mounds of egg whites on the prepared baking sheet. Create a small indent in the centre of the egg whites with the back of a spoon. Bake egg whites in the preheated oven until lightly browned, 2 to 3 minutes. Remove egg whites from the oven and carefully place 1 yolk in the centre of each indent. Place back in the oven until yolks look set, about 3 minutes. Carefully remove cloud eggs from the parchment paper with a spatula or fish slice; slide onto plates. Sprinkle chives on top. You could add some chopped ham to the whites along with the Parmesan cheese. We didn’t like these. Maybe it was the texture? Won’t be making again.